This Demonstration shows optical properties of biological tissue in the THz frequency region. Response of tissue to THz radiation is highly dependent upon the characteristics of the THz radiation source. The theory of tissue response to a THz radiation regime is still not fully developed. We describe some theoretical calculations of the interaction of THz radiation with biological tissue. We also consider absorption and scattering of radiation in the study of some tissue properties. 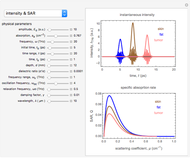 You can select physical parameters such as refractive index, absorption, scattering coefficients, and optical depth as well as the specific absorption rate (SAR), intensity, and dispersion of THz radiation. 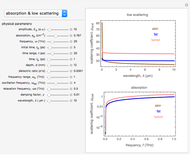 Inhomogeneous tissues with high absorption and low scattering are difficult to study. Excitation resonance might occur, as indicated by a broad absorption spectrum. Snapshot 1: the optical intensity of THz radiation utilizes the beats from two CW laser beams with slightly different frequencies. The intensity and sharpness of the response for each tissue (fat, skin, and tumor) is modeled. Heat transfer for THz radiation power is considered only for the specific absorption rate (SAR) of energy generation. For plane-wave heating by THz radiation, the heat absorption can be approximated from the radiation power and the scattering coefficient. Snapshot 2: the refractive index of an optical medium is a dimensionless number that describes how THz radiation propagates through tissue. It determines how much incident THz radiation is refracted. 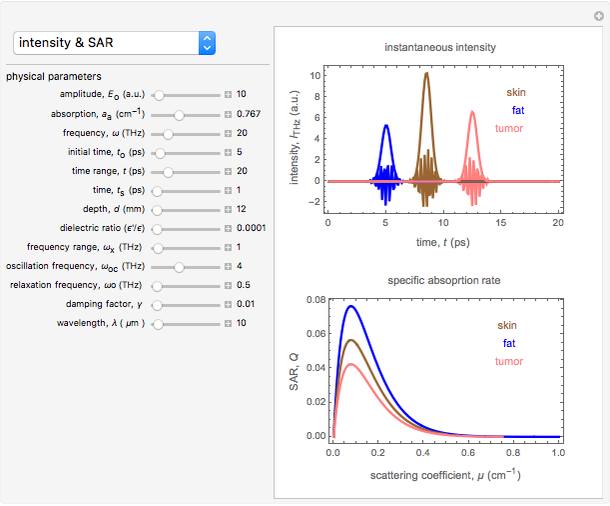 THz radiation crossing the interface between two tissue layers with refractive indices (skin), (fat), and (tumor) can also determine the reflection of radiation between interfaces, as well as the critical angle for total internal reflection. The refractive index of tissues varies with frequency and wavelength of THz radiation, which is known as dispersion. 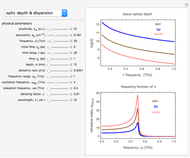 THz radiation propagation in tissue can be described using a complex-valued refractive index. The imaginary part represents the attenuation, while the real part accounts for refraction. Numerical estimates of the refractive index can be obtained from nonlinear dispersion theory. Snapshot 3: the penetration depth of the THz radiation is defined here as the mean free path for an absorption or scattering event. It is the depth at which the percentage of THz radiation transmitted into the tissue is reduced to 37%. 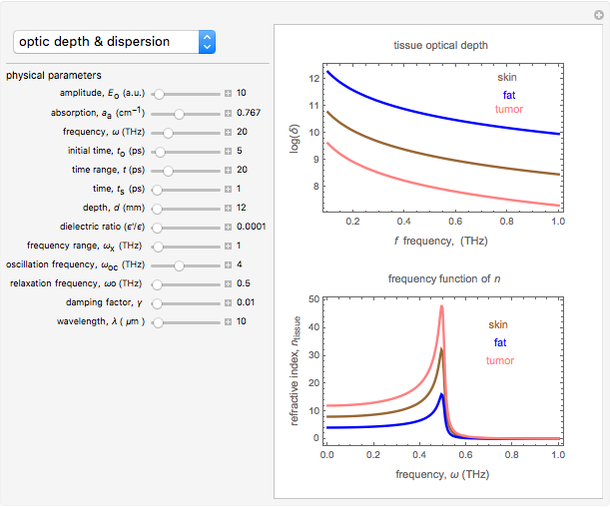 The collimated penetration depth is defined as the reciprocal of the absorption coefficient. 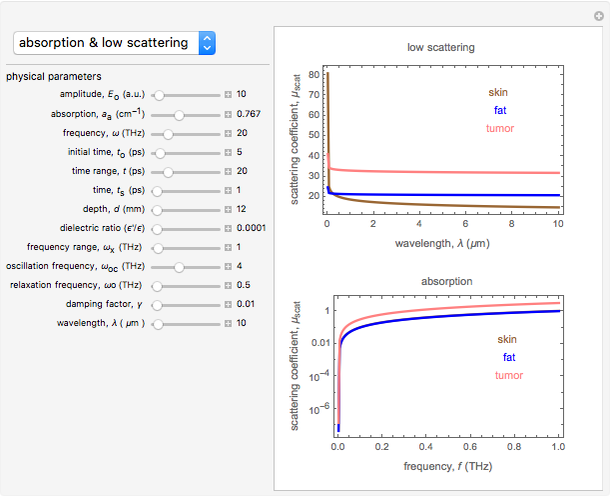 The absorption coefficient is required to compute the distribution of THz radiation in tissue. There are dramatic differences in the penetration depth of the THz radiation at different frequencies. The absorption and scattering of any tissue varies with wavelength, for example, THz radiation at 10 is totally absorbed in the first few of tissue and by water absorption in the infrared (IR). By contrast, THz radiation at 1.2 can penetrate several millimeters of tissue and the associated scattered THz radiation can cover several centimeters. Within this red and near-IR wavelength window, there are no strongly absorbing tissue chromophores. As the collimated THz radiation beam passes through tissue, it is exponentially attenuated by absorption and scattering. For sufficiently weak excitation, the macromolecular vibrations remain mostly unexcited and the Fourier frequency components of the incident signal can be treated independently, with nonlinear wave mixing ignored. A. J. Welch and M. J. C. van Gemert (eds. ), Optical-Thermal Response of Laser-Irradiated Tissue, 2nd ed., Dordrecht: Springer Netherlands, 2011. doi:10.1007/978-90-481-8831-4. M. Hamdi, "Investigation on Bio-Electromagnetic Field of Terahertz Radiation Behaviors at the Interface of Brain-Fat Tissue," Asian Journal of Innovation and Entrepreneurship, 1(2), 2012. journal.uii.ac.id/index.php/ajie/article/view/2826. Muhamad Hamdi and Yusof Munajat "Optical Properties of Biological Tissue in the THz Radiation Regime "